What is your first inclination when you screw up big time when no one you know is around? Do you immediately rush to tell people, or are you secretly grateful no one saw and vow to keep it to yourself? If you're like most people, you tend to keep those things quiet, unless it's one of those 'so stupid it's funny' stories that you're able to laugh about later. We don't really like letting others know how many mistakes we make, do we? Before He was arrested, Jesus told His disciples, "This very night you will all fall away on account of me," (Matthew 26:31) meaning that they would all scatter and abandon Him. But "Peter replied, “Even if all fall away on account of you, I never will” (v. 33). Oh, the confidence! It's easy to be confident you'll stick around through the hard times when everything looks perfect, isn't it? But Jesus knew the truth. "Truly I tell you,” Jesus answered, “this very night, before the rooster crows, you will disown me three times" (v. 34). How that must have stung Peter, hearing that Jesus didn't believe Peter's declaration. So then "Peter declared, “Even if I have to die with you, I will never disown you" (v. 35). Well, that's not what happened, is it? Jesus did get arrested and all the disciples scattered, Peter included. When Jesus was taken away, though, Peter followed. "Now Peter was sitting out in the courtyard, and a servant girl came to him. “You also were with Jesus of Galilee,” she said. Immediately a rooster crowed. Then Peter remembered the word Jesus had spoken: “Before the rooster crows, you will disown me three times.” And he went outside and wept bitterly" (vv. 69-75). Talk about screwing up big time! Where hours before Peter had been sure he'd be willing to die with Jesus, when the threat came, he found himself denying that he even knew Jesus. Once he realized what he had done, of course Peter wept bitterly. Wouldn't you have? I once heard a preacher ask, "How do we know Peter denied Jesus?" When you stop to think about it, the only possible way we know this story is because Peter must have told the others what happened. I doubt Peter ever forgot the shame he felt after denying Jesus, but I think he probably told the story hundreds of times in his life. Not because he was proud of himself, or liked telling about his worst mistake, but because once he shared that story, he could then tell the rest of the story. The first people to learn of the resurrection were some women who went to the tomb to prepare Jesus' body for burial. They arrived at the tomb to find Jesus' body gone and an angel sitting outside the tomb. The angel said to them, "You are looking for Jesus the Nazarene, who was crucified. He has risen! He is not here. See the place where they laid him. But go, tell his disciples and Peter, ‘He is going ahead of you into Galilee. There you will see him, just as he told you" (Mark 16:6,7). Tell his disciples and Peter! In other words, don't leave Peter out. Make sure he knows what is happening. Give him hope. Peter screwed up big time, but that just meant Jesus could show him the depth of His grace. Paul wrote in Romans 5:20, 21 "where sin increased, grace increased all the more, so that, just as sin reigned in death, so also grace might reign through righteousness to bring eternal life through Jesus Christ our Lord." The bigger the sin, the bigger the grace that covers it...and the sin can never be so big that there isn't sufficient grace to cover it. Just ask Peter. I picture Peter all through his life, talking with people who think their sins are too much for God, that God would never want them because they've screwed up their lives too much. I see Peter smiling as he shakes his head. "You think you've screwed up?" he says to them. "Just listen to what I did, and Jesus forgave me. If His grace is big enough for me, it's big enough for you." The truth is, there are people today who think they've screwed up their lives too much for God to ever forgive them. Maybe you're one of them. 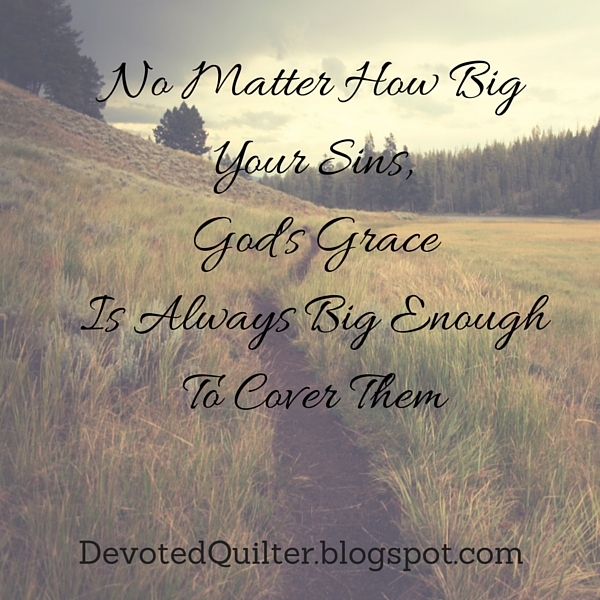 But no matter how big your sins, or how many, God's grace is always big enough to cover them. John 3:16 says, "For God so loved the world that he gave his one and only Son, that whoever believes in him shall not perish but have eternal life." Whoever believes...not only those people who have tiny sins, or those people who hardly ever sin...whoever believes! That means anyone and everyone who believes. Even if your sins are as big as Peter's.